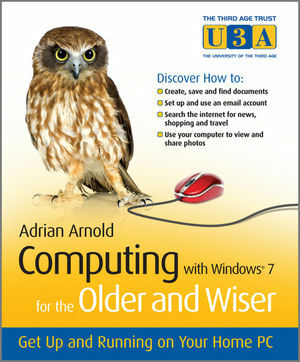 Computing with Windows® 7 for the Older & Wiser is a user friendly guide that takes you step-by-step through the basics of using a computer. Written in an easy-to-understand, jargon free language, it is aimed at complete beginners using PCs running on Microsoft Windows® 7. Adrian Arnold (Colchester, UK) is a computer trainer with Age Concern in Colchester, UK and author of Computing for the Older & Wiser and Internet for the Older and Wiser. With more than a decade of experience in computing training for the over-50s, Adrian knows how to get the best from his students. The uses of a home computer. Fears of using a computer. Financial security on the Internet. Chapter 2 Getting to know the computer screen, keyboard and mouse. The anatomy of a window. Chapter 4 Navigating drives, folders and files. Chapter 5 Getting to know your Windows 7 Desktop. Personalising your Desktop with Themes. Chapter 6 Opening your first program: word processing. The Backspace and Delete keys. Part II The Internet and email. Chapter 9 Understanding email and Internet concepts. No such thing as a free service. Setting up an Internet connection. Chapter 10 Introducing the Internet and World Wide Web. Using the Web- a couple of practical lessons. Chapter 11 Finding things online. Just a note about YouTube. Chapter 13 Booking travel online. Chapter 14 Buying and selling on Internet auctions. Chapter 15 Downloading a program from the Web. Chapter 17 Getting started with digital photography. Transferring photos from camera to computer. Using digital photo services on the Web. Chapter 18 Advanced word processing. Chapter 20 Advanced uses of the Internet. Listening to the radio on your computer. Chapter 21 Using Windows Live Essentials.